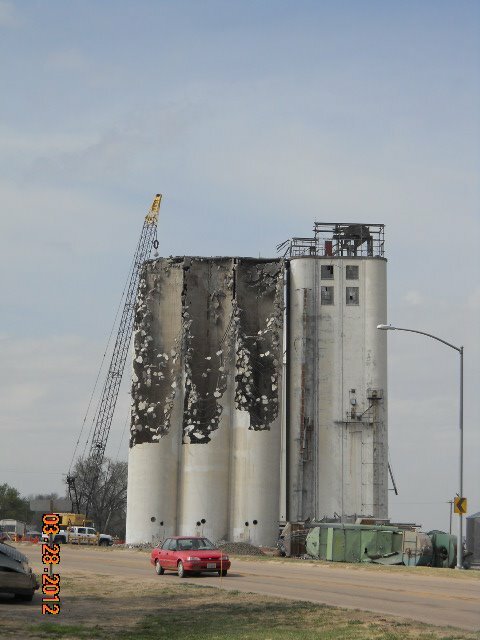 The old Maywood, Nebraska, elevator with its annex built by Mayer-Osborn Contruction Company of Denver, Colorado, was demolished in March of this year. I had planned the trip to see the elevator before its scheduled demolition in 2013. When we arrived in town, I expected to see the familiar straight-up J. H. Tillotson, Contractor-designed elevator with its annex beside it, but it was nowhere to be found. 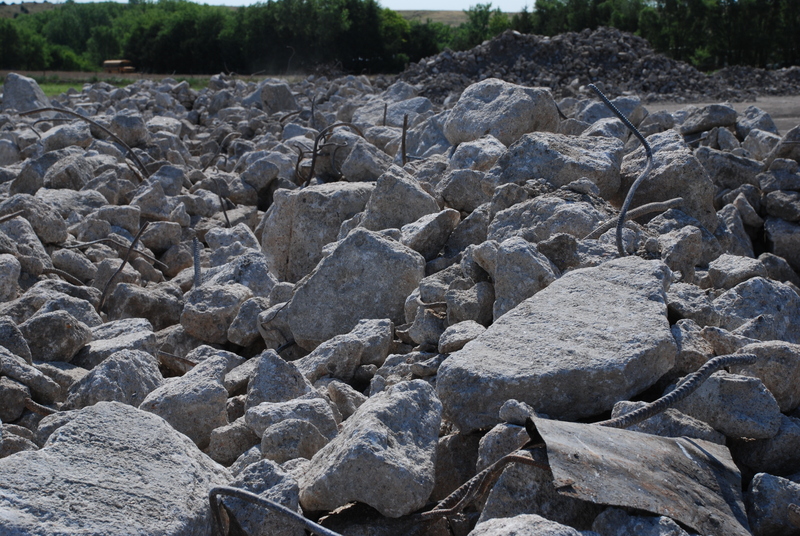 But I saw bulldozers and a football field-sized area framed with rubble piles, with corn impacted into the flat scraped ground. Not good. 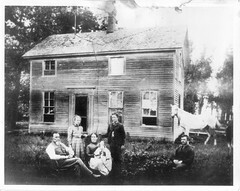 Inside the Ag Valley Co-op office, business was in full swing. A truck pulled up, and a corn sample was vacuumed up and tested inside the building as I watched. 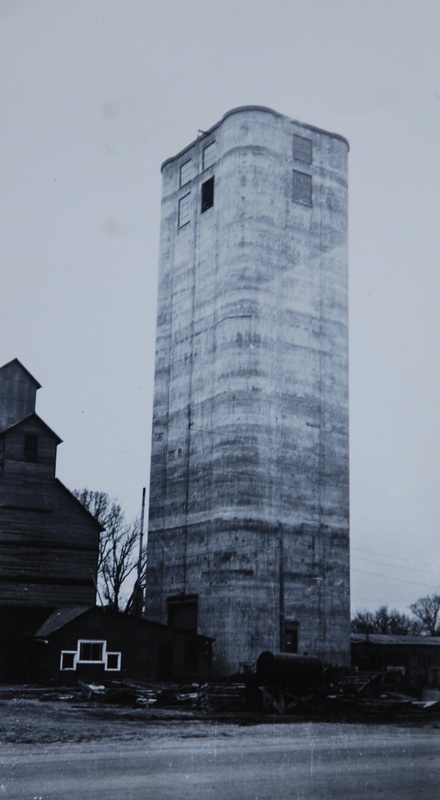 Newer elevators were handling all of the grain. Turena Ehlers and Charla Werkmeister, employees of the co-op, told me how it went. The old Mayer-Osborn annex had a pretty good lean and some leaking problems, so it had been slated for destruction first, with the status of the main elevator left in question. But the main elevator was losing chunks of concrete and was deemed a hazard, so it came down soon after the annex. 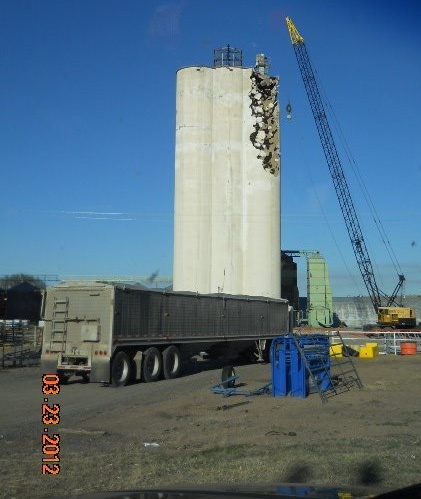 Forest River Colonies, of Fordville, North Dakota, a Hutterite-owned company, tore down the elevator and its annex, with the scrap going to Columbus Metals in Kearney, Nebraska. 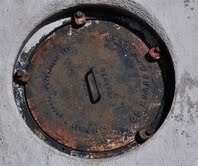 My hopes were dashed for recovering an intact manhole cover with my grandfather’s Mayer-Osborn company name on it. The demolition was quite an event for the town. Carol Wood put together a photo montage and hung it at the Maywood town offices. Bill Schnase picked up pieces of the rubble for his daughter to paint, to preserve the image of the elevator on concrete. Everyone had photos of the demolition. Julie Cox Hazen, Bill Schnase’s niece, shared hers with me. 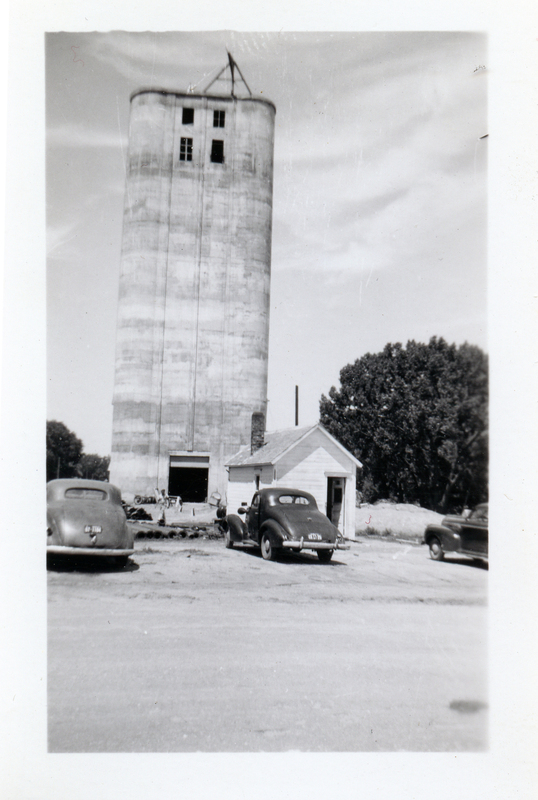 Luckily, Gary Rich visited the elevator last year, taking photos of it in its last year of useful service. 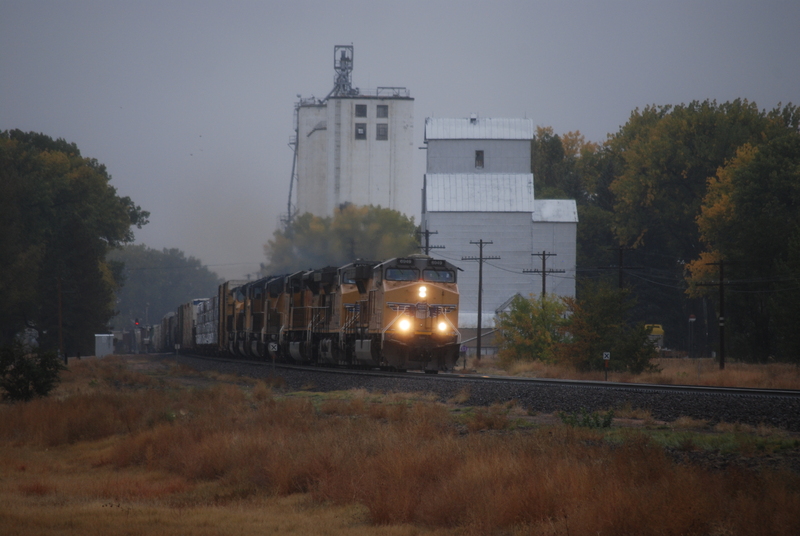 It’s type had been surpassed for a long time by newer, faster grain storage facilities of all kinds. Most of Grandpa’s smaller projects are reaching the end of their service lives. So we are capturing their last moments, mostly, but not always, in the nick of time.